We will aim to meet this month on Wednesday, 15th August, 7.30.p.m. at Pedro Castle, weather permitting. The Perseid Meteor Shower occurs on August 12-13th. This year the new moon will leave the sky dark. Look to the eastern sky in the constellation Perseus. Between 2 a.m. and dawn on August 13, if you get away from city lights, you could see hundreds of meteors. This is one of the best showers of the year. The Perseids are a result of debris in space left by comet Swift-Tuttle. Although the comet is nowhere near Earth, the comet's wide tail does intersect Earth's orbit. We glide through it every year in July and August. Tiny bits of comet dust hit Earth's atmosphere traveling 132,000 mph. At that speed, even a tiny smidgen of dust makes a vivid streak of light--a meteor--when it disintegrates. The shower is most intense when Earth is in the dustiest part of the tail. The mythological illustration that I used last month included the constellation Scorpius, more schematically shown above. Jupiter, the fourth brightest object to light up the heavens, after the sun, moon, and Venus, shines unmistakably in the southern part of the sky, and serves as a guide to the Scorpion. This is a distinctive constellation with its wide head and body curving to its tail. Glowing with a reddish hue at the heart of this asterism is the bright star Antares, the sixteenth brightest in the sky, although out shone this month by close Jupiter. Antares is in the middle of the scorpion's curving body and rivals Mars in its reddish tint. This brilliant red star is one of the behemoths of our stellar neighborhood. If you placed it at the center of our own solar system, it would swallow Mercury, Venus, Earth, and Mars, and almost reach Jupiter. The Scorpion was sent by Gaia to kill Orion when Orion boasted he would slay all the animals of the Earth; now Orion and Scorpius circle each other on opposite sides of the sky. The Chinese included these stars in the Azure Dragon, a powerful but benevolent creature whose rising heralded spring, and in Maori mythology, this constellation can be Maui's magic jawbone used to fish up the North Island of New Zealand. The viewing session this month will be on Tuesday 17th, 7.30 p.m. at Pedro Castle. Last months illustration showed, as well as the featured constellation Crux, Centaurus (Latin for centaur). One of the 48 constellations listed by Ptolemy, it counts also among the 88 modern constellations. This southern constellation is one of the largest in the sky. This half man, half horse marked the southernmost constellation visible to astronomers of classical times. 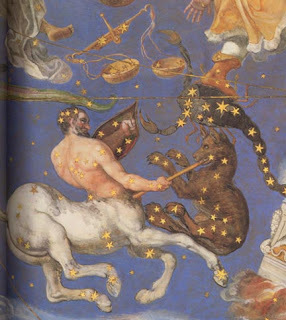 The constellation, as depicted above, represents the death of Lupus, the wolf, on the spear of a heavenly centaur. Early representations of the two constellations actually reveal the figure of a centaur holding a staff called the thyrsus and a wolf. The thyrsus is covered with ivy and grape vines and tipped with a pine cone. These are the ingredients of the godly drink called nectar. The she-wolf is Selene, the moon, who helps in the preparation of the drink. Centaurus contains the closest star to the Sun, Alpha Centauri, 4.4 light years away. Alpha Centauri is also known as Rigil Kentaurus, from the Arabic meaning ‘centaur’s foot’. To the naked eye it appears as the third-brightest star in the sky, but a small telescope reveals it to be double, consisting of two yellow stars like the Sun. A third, much fainter companion star is called Proxima Centauri because it is slightly closer to us than the other two. Beta Centauri is called Hadar, from an Arabic name signifying one member of a pair of stars. 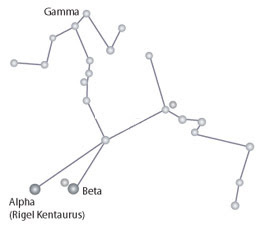 Alpha and Beta Centauri mark the front legs of the centaur, and they act as pointers to Crux, the Southern Cross, which lies under the centaur’s rear quarters. Centaurus also contains the largest and brightest globular star cluster visible from Earth, Omega Centauri. Gamma Centauri, Muhlifain, is a double star approximately 130 light years from Earth, which consists of two spectral type A0 stars each of apparent magnitude +2.9. 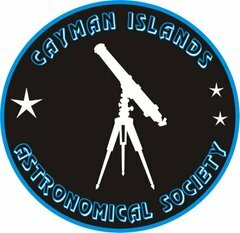 For the resolution of the double star system a telescope of at least 15 centimeters in aperture is necessary. They have an orbital period of 83 years. The star forms the hip or backside of the Centaur and is found directly north of the Southern Cross. Saturn and Venus will be low in the west on viewing night, close to the crescent moon. Both will disappear from the night sky at months end, leaving brilliant Jupiter to shine alone.